Here’s a mind-blowing picture of an actual star going supernova, captured by NASA’s Hubble Space Telescope. Supernovae are extremely luminous and cause a burst of radiation that often briefly outshines an entire galaxy, before fading from view over several weeks or months. During this short interval a supernova can radiate as much energy as the Sun is expected to emit over its entire life span. Continue reading for a video and more information. The explosion expels much or all of a star’s material at a velocity of up to 30,000 km/s (10% of the speed of light), driving a shock wave into the surrounding interstellar medium. 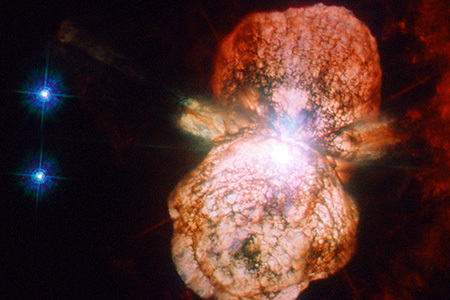 This shock wave sweeps up an expanding shell of gas and dust called a supernova remnant.